This recipe has become one of my signature dishes. I did not create this dish. It was tasted in a restaurant and found it really delicious. By examining the ingredients used in their dish, I was confident that I would be able to adapt and fix up the dish at home on my own. And, it had been a success in making the similar dish! 1) Season pork slices with chicken granule, black pepper and potato starch, for 20 minutes. 2) Heat wok with olive oil over medium fire. Melt butter in heated wok. Add garlic and curry leave. 3) Place seasoned pork slices in wok. Stir fry for few seconds. Then, add capsicum and stir fry to combine, for 2 minutes, or till pork slices tenderly cooked. 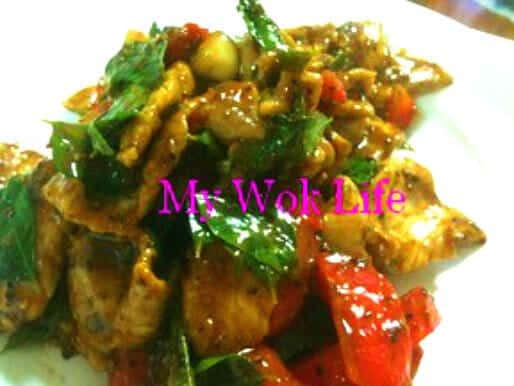 4) Add black pepper sauce and stir fry to combine well, for another 1 – 2 minutes. Heat off and dish up. Serve with steamed rice or olive oiled spaghetti. 1 portion of my black pepper pork slices counts about 300kcal. For more options: Use beef slices instead of pork, if desired. Same thing, the meat has to be thinly sliced with quick stir-cook to retain its moist and maximum tenderness. Tips: Sprinkle some water if find it too dry while stir-frying it. this dish looks great! *note down on my to-cook list* =) I simply can’t thank you enough for having this blog! previously I rarely cook, till I stumble upon your blog about a week ago. =) Have cooked a few dishes over the past few days and love them all! Ok I am tryingg this recipe!! What is black pepper sauce? What can we substitute for this? the dish’s lovely done! i always have problem slicing meat very thinly. they end up like chunks when cooked! do u have any tips on this? thanks! No special trick, just that your knife mustn’t be blunt. It has to be very sharp instead to slice the meat easily. I will also get the butcher to slice it for me, or get the ready sliced packet from supermarket. Black pepper sauce/ paste is store bought from major supermarkets. It is a ready made black peppercorn in paste/ sauce. I did not know any substition for such, unless you can make it at home which is tedious to me (only if I have the time…). Thanks! Is it available in Hong Kong? You may, if desired. But if u ask me, I will not so recommend it as it does not really complement the dish that well. I will instead add capsicum or/ and onion which makes better accompaniment to it. Yes, it’s definitely available there.. It’s called 黑胡椒酱. In bottle usually. Btw, is this dish spicy for kids cos of the Black pepper sauce?